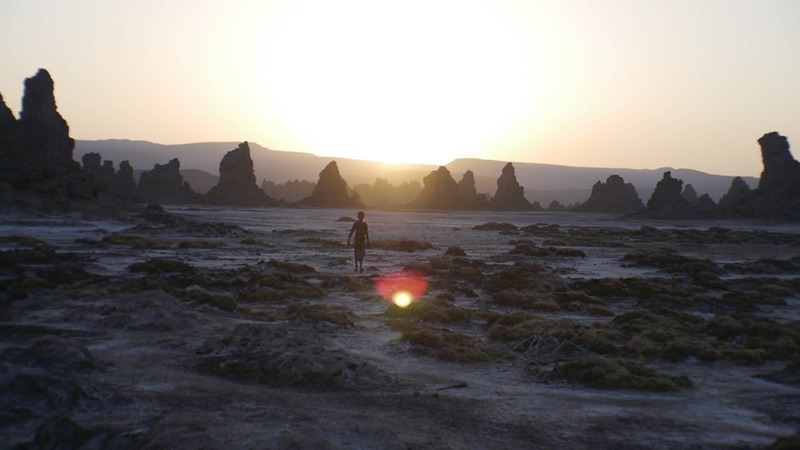 I had never heard of Lake Abbe before I set off to investigate the sights of Djibouti, one of the least visited countries in the world, on the off chance that it could be an interesting destination for vacation. As soon as I typed the country on the Google bar Lake Abbe appeared as the main place of interest. I am lucky, or socially awkward enough, not to remember any of the movies I watch. I can watch them over and over again and not remember I have seen them before. Occasionally, a scene will be vaguely familiar and this will prompt my memory. Although this is a very useful skill for someone who spends hours in planes it may be slightly weird in many a social setting. I had watched one of the Planet of the Apes movies long ago. For a change, I actually do remember watching it but I can’t tell you a word about its plot or who the cast was. Needless to say, I could not tell the landscape it was shot at if I saw it in real life so when we finally approached Lake Abbe and stopped to take in the surreal silhouette from the distance, it was as if I was seeing it for the first time. This is, indeed, where the original Planet of the Apes movie was filmed and the landscapes look, appropriately, from another world. 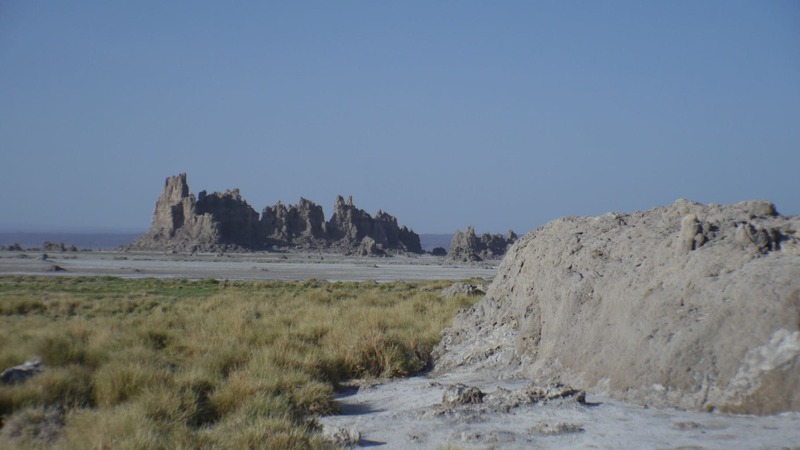 Lake Abbe is reached after a very bumpy and long ride from Djibouti. Although you could theoretically visit it on a one-day trip from the capital the most recommendable itinerary would be to spend the night there and to take a more leisurely journey stopping at other sites on the way. This way, you can also explore other places not just the lake as there is plenty to see on the way. Contrary to what I had expected the road system in Djibouti, where paved, is in extremely good condition. It helps that the country’s main source of income is its port that is almost entirely used by Ethiopian companies shipping their goods overseas. Good roads are therefore essential to the livelihood of the country because all of the containers need to be transported through Djibouti and to the border with Ethiopia by road. Half of our journey happens through one of these main arteries. The road is partially under construction but we are allowed to go through after the workers who man the road block and divert traffic to the barren desert believe we might be government officials and let us through the paved bit. VIPs get to ride on the road even if it is under construction. For the most part, the road is finished. The workers are only giving it the last touches like painting the white lines. Trucks and lorries of all kinds, some of which are pretty long, ride through the desert, sometimes parallel to the road, lifting incredible amounts of dust and sand as they pass. The wind also stirs the smallest particles into tornados that can be seen all along the route. After about half of the journey the road disappears, as we have hit the border with Ethiopia and there is no more justification for the paved road. From then on we simply drive through the barren desert. No lanes, no GPs, no road marks, no signs. Our driver seems to miraculously know the way by hard following nature’s signals and, at times, his heart. I suddenly remember the only other time I drove cross desert into the nowhere, in Sudan, but we had to use a GPs to locate the sites we were trying to find. Finally, after over 2 hours of nothingness and, at times, really impassable roads, we arrive at Lake Abbe. Lake Abbe is a salt lake at the confluence of three Earth crusts pulling away. It is fed by the Awash River and surrounded by extinct volcanoes and depressions. Geologically speaking, it is a marvel and the set of the creation of a new ocean. The three plates pulling apart have created a thin crust that will eventually break and separate the Horn of Africa into its own island. Lake Abbe is part of this and is connected to other 5 lakes. It is a fascinating story. 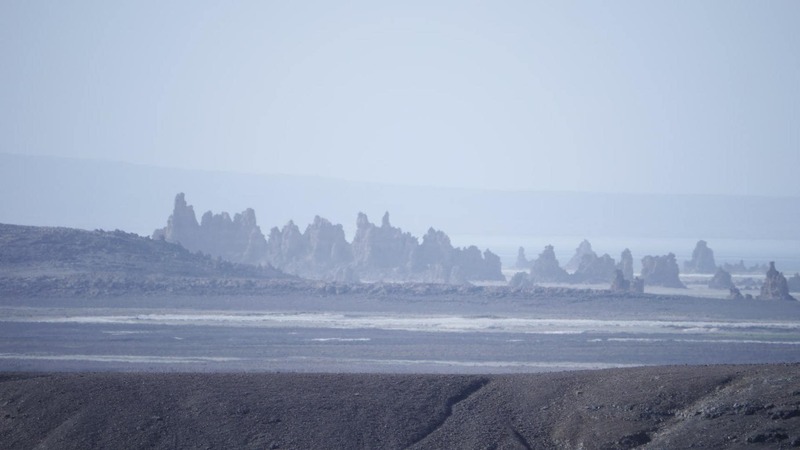 The lunar and otherworldly chimneys jot from the salt flats as if plucked by the sky. These strange shapes were formed when the Ethiopian government decided to build a dam and drain the Djibouti part of Lake Abbe. When the water disappeared, the mangroves that inhabited the lake were covered in limestone and sealed by bacteria creating these indescribable towers. 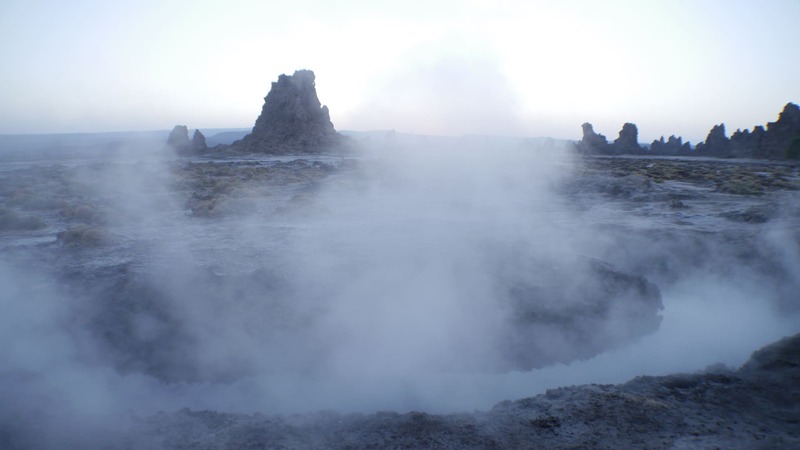 To make it even more magical, the hot springs running below the ground generate steam that flows through the towers and dissolves into the air creating the image of a true chimney. The biggest chimney is 60 meters high and 80 meters in diameters. The entire area is one of the most desolate and inhospitable places I have ever seen. Children cross the vast flat plains every morning and every evening with their cattle. Herds of camels, goats or sheep in small groups walk through this bare territory in search of grass or greener pastures. The hot springs sprout onto the surface in certain areas where the green grass and some lonely bushes take advantage of the water supply to proliferate. These are some of these patches of life dotting the Lake but they are few and far in between. The lake was not drained in full. Most of the Ethiopian part still remains and a small portion can still be seen on the Djibouti side. 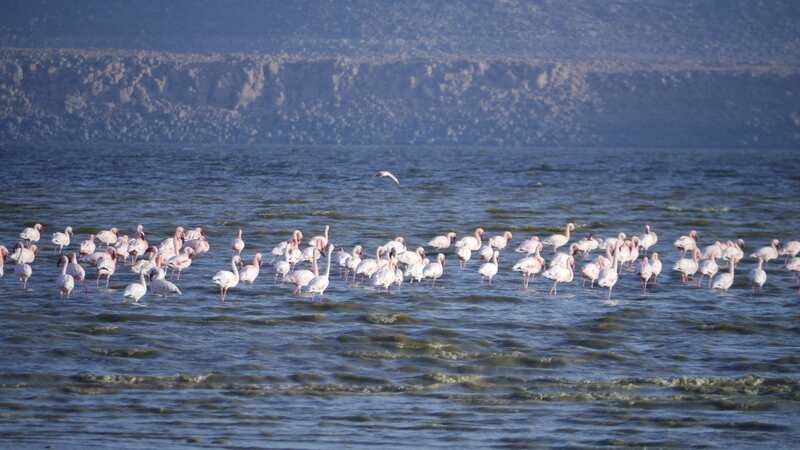 The bacteria that inhabit the lake have helped grow a steady population of worms, which attract pink flamingos. In the early morning, just after sunrise, we walk for an hour through the slippery mud and the quick sands to reach the lakeshore and observe these elegant creatures. We can’t get too close because the permanently wet soft mud and the existence of perfectly hidden quick sands eventually catch with us. I step onto what I think is a patch of mud and sink immediately into the slimy quick sand. Thankfully, my well-anchored foot helps me step back out not without a layer of mud up to my ankle. Lake Abbe is full of natural wonders, a chemical engineer’s paradise filled with chemistry lab’s experiments. Our guide agitates a cigarette in front of the hot springs and the reaction between the cigarette smoke and the hot spring steam increases the smoke coming out of the chimneys as if someone had lit a fireplace. At night, something very strange happens. As the sun is setting like an incandescent ball of fire into the horizon, the moon appears in plain sight. It is an almost new moon, only a thin slice of light preventing it from being completely dark. We can see the entire disk of the moon as if it was an eclipse and then, slowly, the moon completely disappears and there is only darkness. We do not know what happened or if that was the day the moon turned into new moon but, suddenly, there are just the stars. I was looking forward to the night sky as much as I was to seeing Lake Abbe. I thought that the darkness of the desert would show off a deeply bright starry night. Although there were more stars than I had seen in a long time we could not easily spot the Milky Way despite the lack of moonlight. 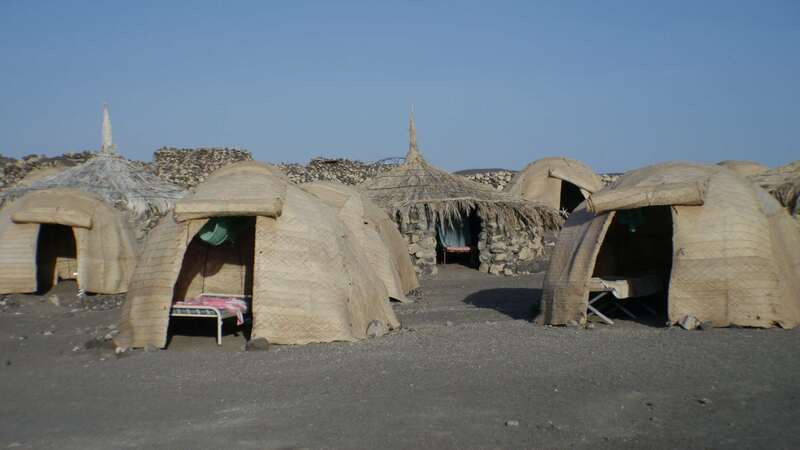 We spent the night at one of the basic camps that are present at most tourist sites in Djibouti. It is possibly the barest place I have slept at in a very long time. Our huts contain just a very simple bed frame and a thin mattress. There is a mosquito net above the bed but it serves no purpose, I discover the following morning after being bitten over 100 times in just one night. The walls of our hut are shaped like an igloo. They are made of a thin wire structure covered with weaved mats that do not reach the floor. They mimic the mobile houses of the nomad tribes but in an even simpler fashion. The nomadic families cover the bottom of the structure with stones to hold it still and protect from any animals or from the unforgiving wind. Ours simply hang without reaching the floor. Our guide tells us that sometimes, a jackal approaches in search of food. Not to worry, he is more scared that we are. This is not very reassuring though. At night, the wind incessantly beats the walls making it very hard to sleep. The camp only has electricity for a few hours after sunset when they turn the generator on. The toilets are Western style, but they do not flush so it better to use nature. There are showers but they are pretty dusty and towels are not provided. Water comes out of a hose attached to a water deposit that collected water when it rained. In the middle of the night there is just pure darkness and, since we visit in the Djibouti winter, the temperatures have dropped slightly below the 20 degrees and are aggravated by the desert wind. Tired of the mosquitoes and restless, I sit outside at 5am on one of the plastic chairs wrapped round with the small blanket we were given with the bed but the wind is too strong and cold to stay there for too long. At least the wind keeps the mosquitoes away. No wonder all the guides and locals are sleeping out in the open. Watching the stars is a privilege for someone who lives in the city. The wind is what defines Djibouti for me. No matter where we were, the wind is constantly slapping us. It is dry and hot during the day, cold at night, and almost always present no matter what part of the country. 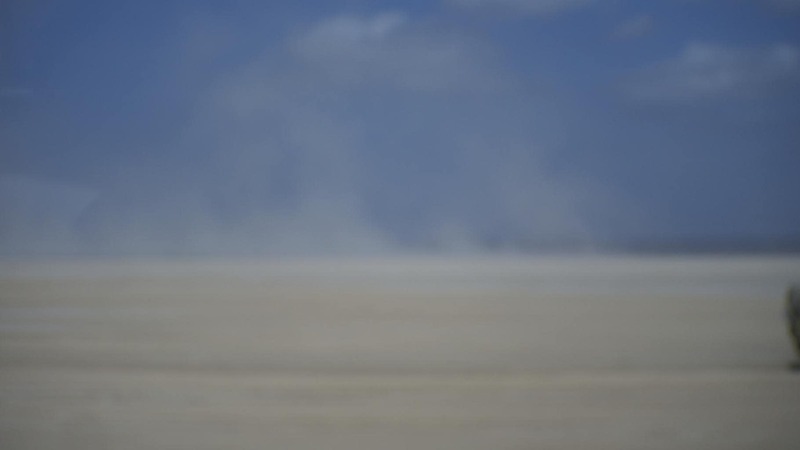 In the desert, it brings the occasional sand storm. It is unforgiving and indiscriminating. In the nothingness of the desert it is even strongest, acting as if it was king. It controls everything, it determines the pace of life and it calls for a headscarf which is also useful to protect yourself from the very strong sun and the lack of shade. Before we depart the next morning we make a final stop to see the exact set where Charlton Heston’s 1968 The Planet of the Apes was filmed. Right in front of it there is a convoy of French and Djibouti army tanks and trucks. Almost everyone in the group is working to get a tank out of the mud. The heavy vehicle has sunk in the soft mud. We walk up a path inside one of the chimneys into a small aperture that looks like the inside of a volcano. The movie was filmed there with the chimneys as a background. The Lonely Planet states that you can climb some of the chimneys but their fragility is apparent to the touch. As soon as the bacteria layer which protects the fine limestone is scrapped off the chimneys crumble to the mere touch. Our guide admits that there are only two predators to this lunar landscape: human beings and rain. There isn’t much of the latter so it is up to us to makes sure that, should tourism take-off, measures are in place to prevent people from climbing on these delicate natural beauties. Even touching should be forbidden. One does not need to feel or jump on these wonderful creations to enjoy the surreal and delicate eco-system they represent.